An epic sourcebook that features rules for designing your own super-organizations, the Jury, the S.C.R.E.T. government agency, Game Master tips, villain teams, and a rogues gallery of 80+ villains waiting to drop into your adventures. 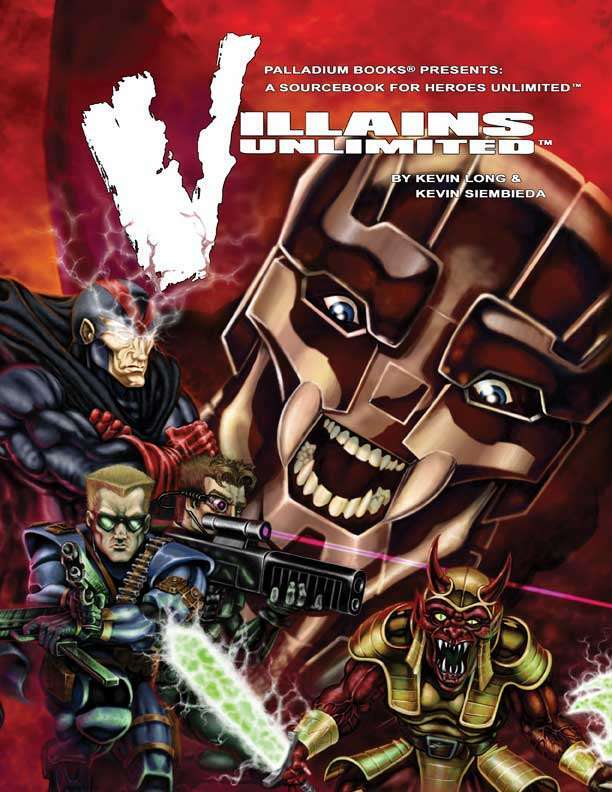 80+ villains, plus villainous teams and organizations. The Jury – heroes or villains? A self-appointed group who polices superheroes and takes down those who become evil, reckless or crazy. S.C.R.E.T. – Superbeing Control, Retrieval, and Elimination Teams, a multi-national organization designed to handle “superhuman” problems. Fabricators, Inc., an evil organization that supplies evildoers; their weapons and gizmos. Magic tattoos, weapons, cyborgs, a crazed world conqueror, monsters, madmen and adventure ideas galore. 224 pages, written by Kevin Siembieda & Kevin Long. Are the characters updated to fit with Heroes Unlimited 2nd edition rules, or ported over from the 1st edition unaltered?